Eugene Simonet (Kevin Spacey) is a new teacher in a school, a terrifically facially scarred man. 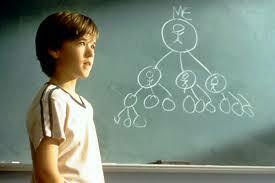 He sets his class the task of attempting to change the world, a task that gives young annoying child Trevor McKinney (Haley Joel Osment) the idea of paying it forward – you do a favour for someone, then they do three favours for other people, and so on. Meanwhile, he is also trying to encourage his alcoholic mother, Arlene (Helen Hunt) to change her ways. Then there is a journalist who has had someone introduce the concept of paying it forward to him and wants to discover the origin of this movement. I avoided this film for so long. It just sounded so terrible; cheesy and awful. And it was. I really like the concept, but the script was so twee and terrible and the entire thing felt clichéd and repulsive. Just thinking about it now makes me cross. I need something good to rid my mind of this.